Diodes Incorporated recently presented Indium Corporation with the prestigious "Full Mark Supplier" Quality Award for the 3rd Quarter of 2007. Mr. Guoping Lu, Quality Manager for Diodes/Kaihong Electronics Co. Ltd, presented the award to Indium Corporation's Dr. Andy C. Mackie, Product Manager for Semiconductor Assembly Materials, and Michael Qiu, Area Sales Manager for Semiconductor Assembly Materials in China. According to Andy, "We are very pleased to accept this award from our valued customer. It demonstrates once again the emphasis that leaders in the Chinese semiconductor and power semiconductor industries place on quality." 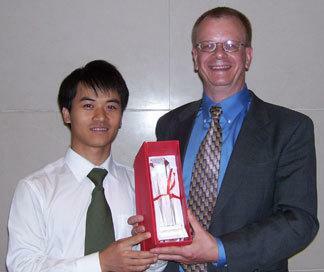 The presentation of the award had been delayed by the Chinese New Year snowstorms and travel schedules. Diodes Incorporated is a leading global manufacturer and supplier of high-quality, application-specific standard products within the broad discrete and analog semiconductor markets, serving the consumer electronics, computing, communications, industrial and automotive markets. Headquartered in Dallas, TX, with facilities in North America, Asia, and Europe, the company has achieved the Quality Awards of QS-9000, ISO-9001:2000, TS16949:2002 and ISO 14001 certifications. For more information about Diodes Incorporated, visit http://www.diodes.com. For more information about Indium Corporation visit http://www.indium.com/ or email abrown@indium.com.